Enough resting on my laurels, on with the next 10 years! Here is another force for Dragon Rampant! The Elves of the Southern Isles are usually a reserved, most unwarlike people, rarely seen in the lands of men. Rumors claim they inhabit distant chain of islands in warmer climes and travel only to occasionally trade with the other peoples of the known world. Decades, or even generations, can go by without seeing their ships on the horizon. They have never been known to meddle in the affairs of men-folk, nor even come to the aid of their continental kin (the Elves of the Woods). When moved to violence, it is for their own purposes, and they strike as if from no where with a swiftness and ferocity that leaves their foes bloodied and wondering what has happened (well… those that survive…). 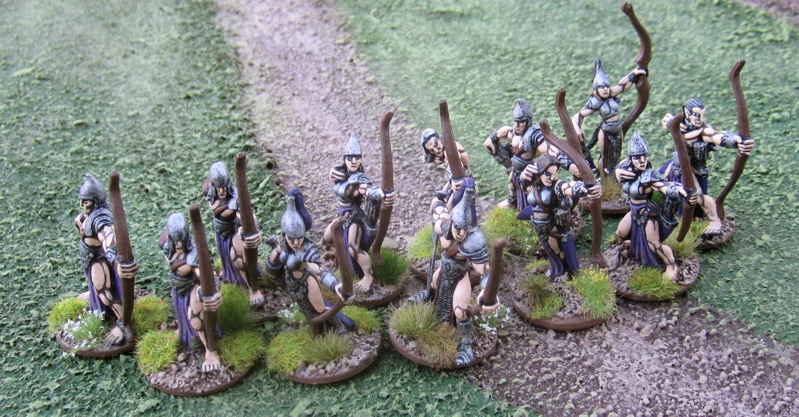 These figures are all made up for old I-Kore Celtos Sidhe figures. I picked all but four of them up from a bargain bin at my friendly local game store (Dragon’s Den Games) for $1 per pack!? The other four I recently ordered from Brigade Models who currently sell the line. Elf Wizard – not regularly part of the force, I envisioned this as an option to replace the leader, or one of the archer units or perhaps both units of spear… unfortunately the most obvious way to field him (Light Foot, Single Figure Unit, Wizard) ends up being 7 points, which doesn’t allow him to just slip into any of those 6 point slots… I suppose the other option could be (Heavy Foot, Single Figure Unit, Wizardling), which would be six points and he’d only have the use of 3 spells. OR I could just call him (Light Missiles, Sharpshooter, Single Model Unit) and say all his offensive spells are pretty much just like a whole unit of elves shooting. These aren’t really offensive warriors – truthfully they aren’t really warriors at all – they are sailors and crafters and such that have had to take up arms to defend their realm (or the interested of their realms abroad). Their task at war is to guard the flanks of the War Leader (who IS a professional Warrior – who has spent his life training for combat) and protect the Archers. 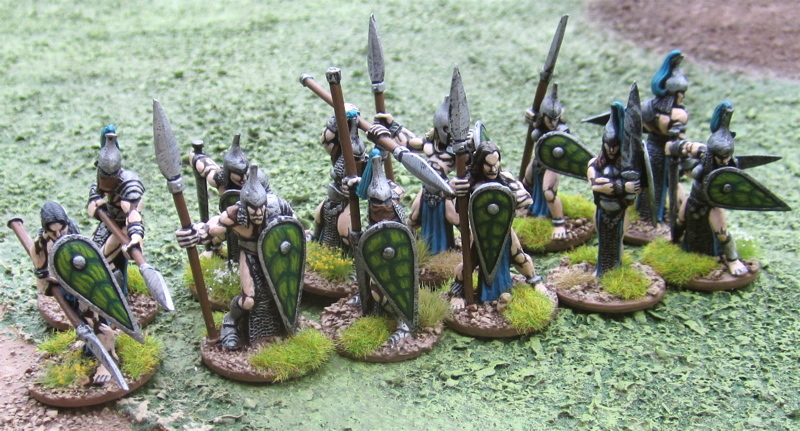 Four of these ones are newly painted as well – they are the ones I recently ordered from Brigade Models. The rest have been partially repainted as they were originally painted in purple like the unit above. No, really… This is the end of this distraction, and the urge to paint more stuff for Dragon Rampant... well... until I actually PLAY a game... then I might be distracted all over again!? Rogue Stars: Skirmish Wargaming in a Science Fiction Underworld arrived today and I am VERY excited about it. It shouldn’t cause any trouble on the painting front, however, as I have NO shortage of Sci Fi figures that could be used for this (or even Modern… or Old West…? figures that could be used in a pinch) – Perhaps we’ll see a return of Mad Willie to the tabletop (The Scottish gunslinger who doesn’t believe in lasers...?) – and the rest of the Crew of the Muttonchop Express! Ten years ago this week we got a new computer. It’s an imac. Don’t ask me what version. The computer it replaced was one of the original imacs (You know one of THESE). I think we’d had it 8 years at that point. That original imac was getting super slow at doing stuff because it was clogged up with programs and stuff it just couldn’t run and navigating the internet was painful as it took forever to load every website. Some wouldn’t ever load. With the new ability to navigate the interwebs I decided it was high time to start a blog – to reach out to my fellow game nerds and hopefully inspire others as others had inspired me with theirs. So ten years ago on this day (20 December 2006) I started this blog. I’m still using that same computer. I am loath to get a new one. Amanda has a slightly newer one that her and the kids are using. I don’t like the new photo program – it doesn’t have the same function as the one on this computer – how does THAT work!? A newer program on a newer computer can’t do the things I like being able to do on my old one!? Anyway… This was meant to be a celebration of 10 years of blogging and a little look back, but instead it’s turned into a whiney rant about computers and the annoyance of having to buy a new one every decade. I should have got on this earlier, so here are a few random highlights of the last ten years. In those ten years I managed to crank out 1475 posts. (Damn… if I’d only cranked out 25 more this could have been the 1500th post!). just before the 6th anniversary of the blog I posted my 1000th post: A Bit About Me, which itself was a bit of a retrospective of all the gaming I’d done over the years (so I guess I don’t need to cover that again…). While trying to think of what I was going to write for this post I got to looking at the Blog labels (over on the left there) and considering how much of the blog was devoted to which subjects. I should point out the blog post labels aren’t necessarily the best indicator of how many post there are on a particular topic sometimes posts on a given topic might fall under two labels and I know sometimes I might both, but other times I may have only used one or the other…. 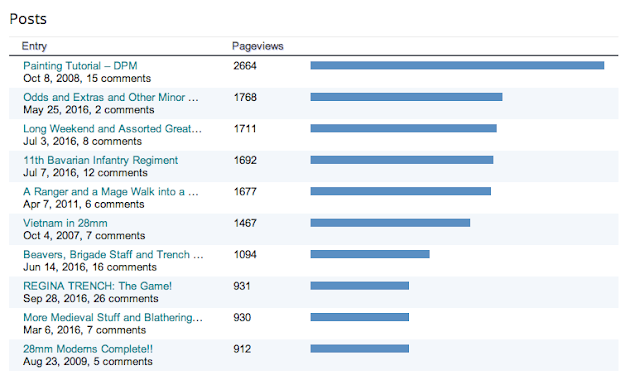 At this point, though, I’m not going to go through 1475 posts to make sure they are all accurately labeled!! Of the 1475 posts over the last 10 years at least 875 of those posts fell under the label Painting Update, which are just posts showing off what I’d managed to paint since I last posted stuff. I think the next more prevalent were Hordes of the Things (at 184) and DBA (at 127), which makes sense as I played a LOT of HotT and DBA (and painted a lot of miniatures for those games) – especially in the earlier years… but not-so-much lately. I was surpeised to notice WW2 was at 140 – especially since Flames of War is at 3, Blitzkrieg Commmander is at 28, Bolt Action is at 14 - but after thinking about it a bit I realized a lot of those would have been painting updates on all the 28mm WW2 figures I’ve painted and were at first used for Savage Worlds. Savage Worlds is currently at 91, which I also found a bit surprising – because in 2008 I started a whole separate blog (Savage Timmy’s Playhouse) devoted just to Savage Worlds gaming – I did this because a lot of my Savage Wrolds gaming was getting more RPG-ish than tabletop miniature wargaming and, at the time, I wanted to keep this blog, just about the miniatures… That has changed as and this blog has become more of a generic gaming blog (there are 32 posts with the Board Games label – indeed there are a number of labels now for specific board games. I don’t really post about ALL the board games I play… but I do sometimes. 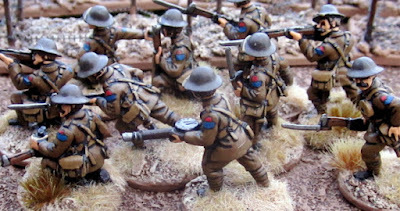 125 posts have the Great War label, but only 35 have the Contemptible Little Armies, which had been my “go to” game for most of the Great War gaming I’ve done. So most of those posts are probably just of painted miniatures. 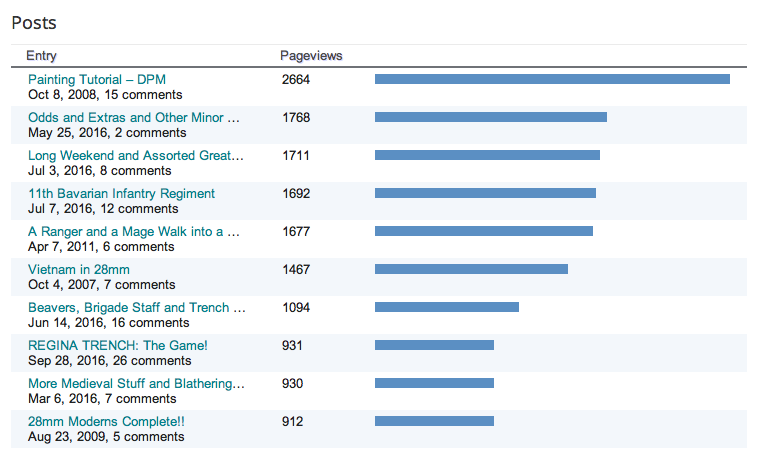 There are 60 posts with the Vimy label. There are 113 posts with the Fantasy label. This is a good example of where I’ve used a label sometimes or started using it after a time ut not all posts about fantasy have been given this label. 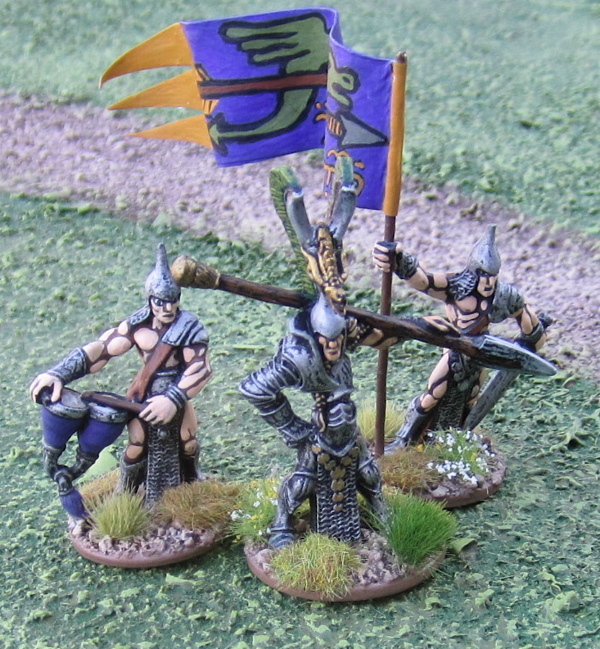 As mentioned above Hordes of the Things - a fantasy game - has 184 posts devoted to it… yet Fantasy only ended up on 113 and a bunch of those would also be on the 48 posts with the Song of Blades and Heroes or the 36 with Frostgrave label – and 20 posts have the Dragon Rampant label – and I’ve only played the game twice. Cold War Commander Cold War Commander (50) and Savage Worlds Modern Ops (18), and more recent ones would be Force on Force(19). Zulus (34) than Zombies (34)!? Blogger has really only been tracking my stats since 2010, but for most of those last 6 years my blog has been getting, on average, about 12000 hits – something screwy has been going on since the spring because they went WAAAAAY up in May, June and July – that can’t actually be humans checking – especially considering there was nothing overwhelmingly exciting and new on the blog at that time. Some of the most popular posts continue to be The DPM painting tutorial, A Ranger and a Mage Walk into a Forest…, 28mm Moderns Complete, and Vietnam in 28mm… I’m not sure how Odds and Extras and Other Minor Distractions, Long Weekend and Assorted Great War Canadians, Beavers, Brigade Staff and Trench Mortars, or More Medieval Stuff and Blathering About What to DO Next?! ended up with so many hits…? Or how they surpassed some of the other big hits of the past like Quest for the Skull Sword, or 10th Annual Wargaming birthday Bash – Ronin Report, or The Dark Ages DBA Campaign…? 232 games of Savage Worlds. Some games may not have been tracked… I’m sure I’ve played a few games of Wargaming 19th Century Europe in there… Or maybe I just missed them when copying and pasting stuff…? (not going to bother listing all the board games… go to the hyertextified-link above if you want to see those too…). Well that’s enough blathering… I think I should just stop now. I’ll finish up by saying the most rewarding part of the whole experience has been, as I originally set out to do, connect with other game nerds out there. I can’t tell you how much I’ve appreciated every comment that people have been so kind enough to take the time and post. You guys are all awesome! Thanks for a great 10 years. Hopefully I’ll be boring you with another retrospective in another 10. If you've got a moment how about drop me a line below and remind me how long you've been following the blog and what your favourite post was so far! Barbarian Warrior from Copplestone Castings - actually the figure is a “Cave Woman”. The weapons provided were clubs and stone weapons and such. A friend of mine has been running a D&D 5E Primeval Thule campaign that Amanda and I have been playing in since September. She’s playing a red-haired barbarian warrior from the frozen north – but has been working as a pit fighter in Quodeth for the last while. The period is “Bronze Age” so I found this long axe that looked a little like a Bronze Age axe and so stuck it in the cavewoman’s hand and now she’s got a figure of her own (well, she had another figure of mine that she was using, but this one is a tad more accurate…). Dwarf I’ve had for ever. I think it’s an old GW figure…? Stripped, re-based and repainted. 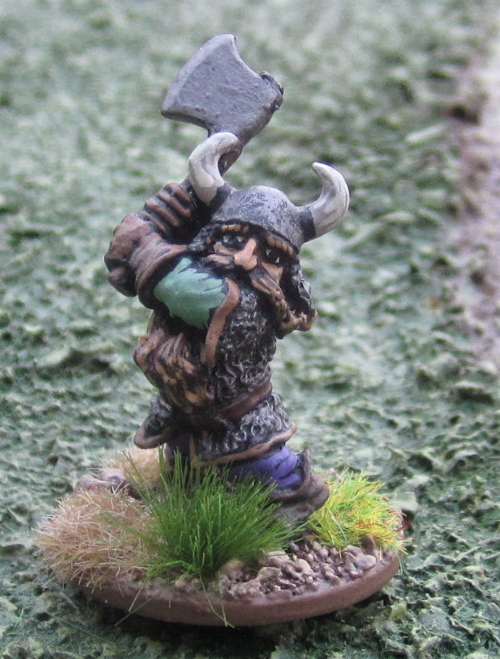 More Dwarves – from Black Tree Design - one of my two Black Friday-ish purchases. How good is your understanding of Runes? Anyone care to guess what I was trying to spell on the banner…? Dwarf Wizard (Single Model Unit, Wizard or Wizardling, Heavy Foot?) 6-8 points? The other package I ordered on or aroung Black Friday also arrived with the remaining Elves I need for my Celtos Sidhe Elf Warband. Seems more likely I’ll just finish up that Elf Warband, however. I'd hoped to crack 800 foot figures painted this year... can I do it? another 52 figures in the next two weeks...? That'd require some serious motivation - which I have been lacking lately. Actually the next post will probably be a look back on 10 years of blogging! Look for that on Tuesday! More distractions this week… More colourful and pretty things to get me through these dreary dark days of winter... I know, I know... Napoleonics are colourful and pretty too... These I might actually PLAY with some time in the not-to-distant future. A completed unit of Orcs for Dragon Rampant. I think I’ll field these are Heavy Foot (@4 points) or possibly Offensive Heavy Foot (@6 points). Only four of these are actually newly painted…. and a couple were recently re-based. I think they are old Citadel pre-slotta fantasy figures. I’ve had them for over 25 years. They’ve been rebased and repainted a few times. Of course there are 14 of them here which is actually more than I need for a Dragon Rampant. Of course I wasn’t thinking of Dragon Rampant when I bought them 25+ years ago… I guess I could just say the musician and standard bearer are just there for show – only the armed ones count as strength points…? 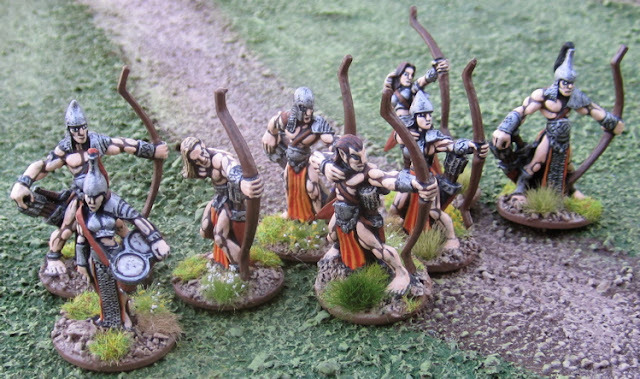 Elf Archers for Dragon Ramapnt – Light Missiles with The Sharpshooter option (6 points). Nothing newly painted here – these were just recently rebased. I originally painted them eight years ago and based them for Hordes of the Things. Originally it was a unit of three bases of six. So only twelve were used to make this unit. The others ended up as the core of the next unit below. Beginnings of a second unit of Elf Archers for Dragon Rampant – as above. 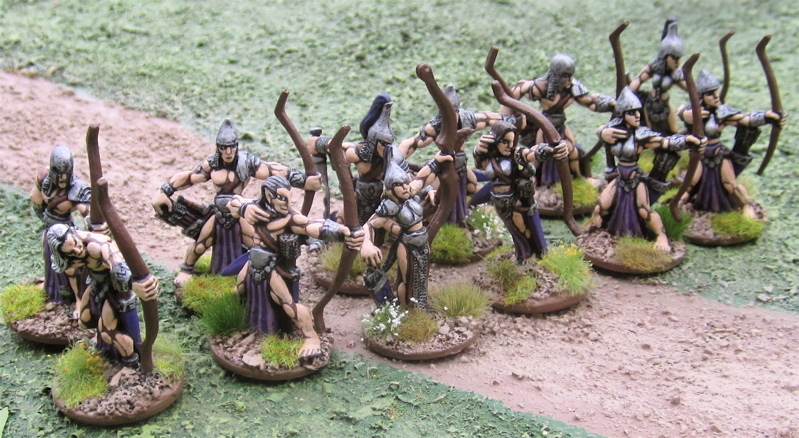 These are more of the same I-Kore Celtos Sidhe that were in the re-based unit mentioned above. I’ve partially repainted these to make them a bit distinct from the others above. The Drummer is newly painted and I actually ordered another four from Brigade Models (which now produces the Celtos line) to finish up the unit. These are all newly painted. I’d had them sitting aside to become elements of Spear in an Elvish HotT army (with the aforementioned archers above) but when I did my stock taking I decided I didn’t really NEED more than TWO Elvish HotT armies and I’d need to order a bunch more stuff to make a complete HotT army of Celtos Elves, whereas I only needed four to make a complete Warband for Dragon Rampant. I was trying to make the shields look like leaves, but I’m not totally happy with how they turned out. Despite my dissatisfaction, I can’t be bothered to repaint them. I do have another, nearly identical unit of Light Foot to paint up for this warband. I’m not sure how to paint them now. 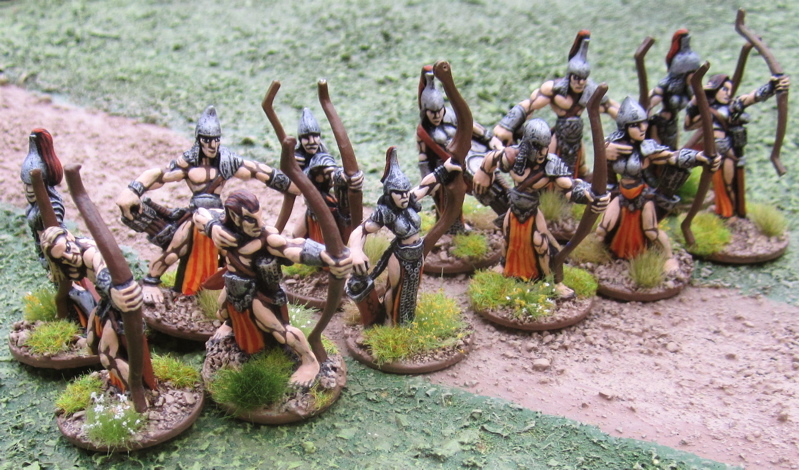 I had originally though of just painting them all in purple – to match the existing unit of archers… but then thought that would be too dull. Then I was going to go with all cool colours – greens, blues, purples. The archers would be purple and each of the units of light foot would be green and blue, respectively. But then I got the idea of painting the second unit of archers a different colour to help differentiate them. As I already had (or had planned) units in green, blue and purple, I somehow decided to do the second unit of archers in ORANGE – the OPPOSITE of a cool colour…!? Then once I got painting these Light Foot I decided to do their shields green-ish to look like leaves… Now I’m not sure how to paint the next unit of Light Foot. 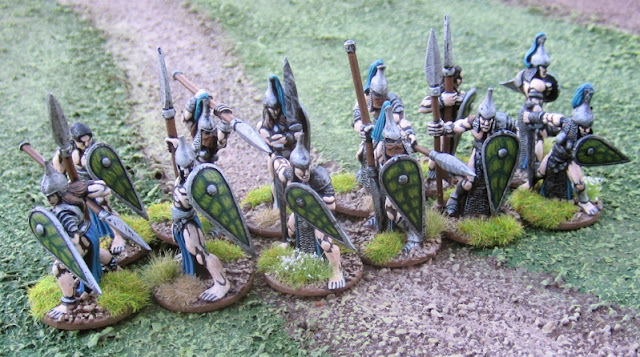 I was going to do them in green – the cloth they’re wearing, at least, but not sure what to do with their shields… again with the green leaves – then they’ll be all green. Would that clash too much? Then I got the idea of painting them like autumn leaves in browns and red and yellow… but with green cloth? Is that going to look good? Or should I do them with Brown or something else…? GAH!? I don’t know. Whoever said painting fantasy stuff was less stressful because you never have to hear anyone complain that it’s “historically inaccurate” was wrong. Just WRONG! Or maybe I’m the only one that stresses about the aesthetic coordination of their fantasy elf units…. Anyone else out there cause themselves this much anguish over such things? Share your pain in the comments below! Elf Wizard for Dragon Rampant. It seems like Wizards are typically fielded as Single Figure Units of Light Foot (3 Points) with the Wizard Option (+4 points). This guy Is another newly painted model. He wasn’t originally planned as part of the warband. 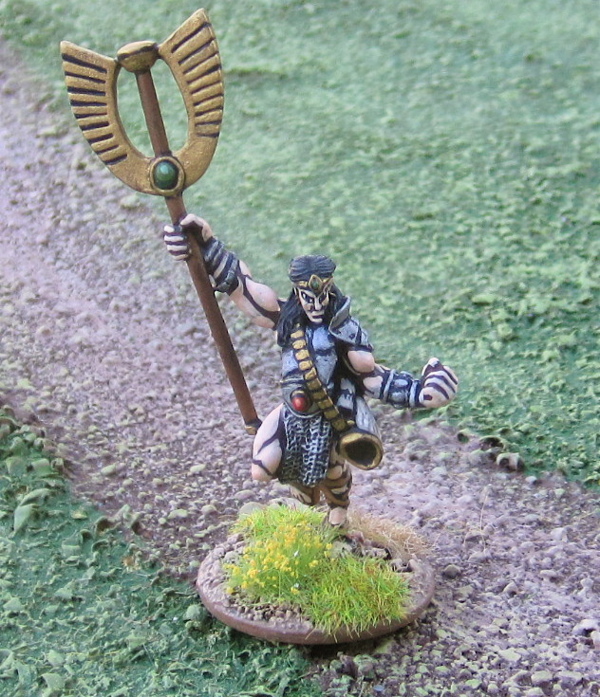 He was originally going to be a standard bearer in the spear unit (because that’s what I thought he was). 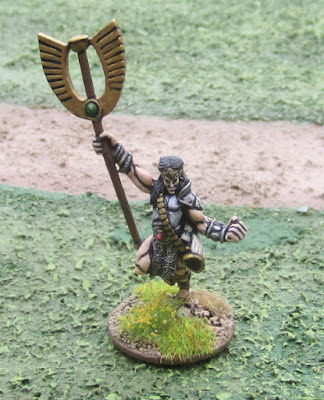 When I was looking through the Brigade Models site to find myself some archers and got to thinking about adding a mage of some sort, I came across this guy and realized I already HAD a Celtos Sidhe wizard. I didn’t really dig on the look of any of the other witches and wizards so I just decided to stick with this guy. 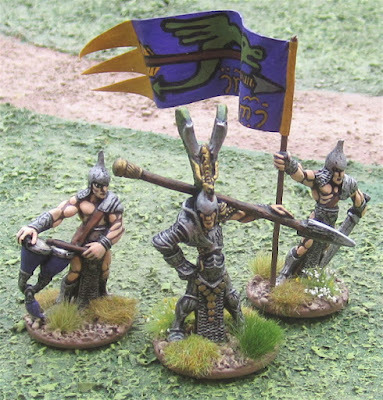 Elf Warlord for Dragon Rampant – which will be fielded as a Reduced Model Elite Foot unit (6 points). I painted him a few weeks back. Just thought I’d post a picture of him with the rest of his unit – freshly re-based musician and standards (originally from the archer unit above – hence the arrow on the standard). If I ever got playing in a campaign and I came up with a character for this warlord I might come up with a new standard… but for now this will do. I’ve been feeling a bit… despondent lately… and having a hard time motivating myself to do any painting, let alone painting stuff I feel I “should” be painting. I managed to get some paint on some wee micro SF figures and vehicles, however. They were “low hanging fruit” – a small number of things that finished up units. The complete force so far. The force is notionally organized for Future War Commander. Each unit is meant to be a Company within the Space marine chapter and elements representing roughly a “platoon” worth of troops or equipment. From what little I’ve seen of the GW fluff, Space Marines don’t seem to have a rigid structure of platoons and squads. Companies instead seem to be organized of a bunch of squads – with varying amounts of organic support elements. I’ve decided to keep these companies as one type (as, for a logistician, it’s just going to be easier that way – otherwise company quartermansters would have to have spare parts and ammunition for piles of different equipment). Rather than thinking of these as “platoons” I try to think of them as “strength steps” within the company. The companies I’m organizing range from 3-6 elements. The force above thus represents a company of Terminators, two companies of mechanized marines with Rhino APCs and a light Assault company of Marines equipped with jump jets. I still have quite a bit yet to paint! I have a third company of mechanized Marines with Rhinos, and another with older pattern Land Raiders. I have two (or maybe three?) more companies of Assault Marines (perhaps I’ll make those companies larger – two companies of six rather than three companies of four…). I also have a company of marines on bikes and some speeder thingies – perhaps they might be two wings of a fast support or scout company? I don’t know. I also have a few more companies worth of marines that will just have to leg it without an APC or IFV type armour to carry them into battle. For support I have nine assault-gun-like vehicles that seem to be built on a Rhino Chassis – and can never remember what they’re called. I’m not sure if they should be organized in two companies (one of four, one of five) or one over –sized company (of nine) or maybe they should all just be parceled out to the various mechanized companies for organic direct support…? I also have four other support vehicles (also built on a rhino chassis) with rocket launchers (one company of four – or parcel them out as well..?) I could end up having rather large companies with 5 Rhinos/Land Raiders carrying Marines with two assault guns and a Missile Launcher support vehicle in directs support moving up with the Marines. I picked up a command pack of various 6mm metal command figures that I’d like to arrange as a Chapter Command element at some point as well. I got to thinking about working on these after I did my Stocktaking last week – I didn’t even count up these, but I decided to abandon a plan I’d been forming of buying some modern micro armour to do some Cold War Goes Hot gaming with Cold War Commander. (It’s all the new Cold War FoW stuff that’s got me thinking of Cold war stuff again – they look so nice, but I just can’t be bothered to play FoW or buy and paint 15mm). Instead I decided to get to work on the Micro Sci.i stuff. Maybe if I get them all done (or at least a decent portion of them) and actually play some games of Future War Commander with them and… you know… actually have fun doing so… well them maybe I could treat myself to some new Micro Modern figures (assuming I’m still interested). I should really dig out the rulebook and get a game in. I probably have a similar number of Eldar finished....? I’d like to say I’ll be getting back to the Great War Canadians… but it seems more likely I’ll paint a few more “fun” things before getting back to them. There are some Elves for a Dragon Rampant that I might put some paint on…? 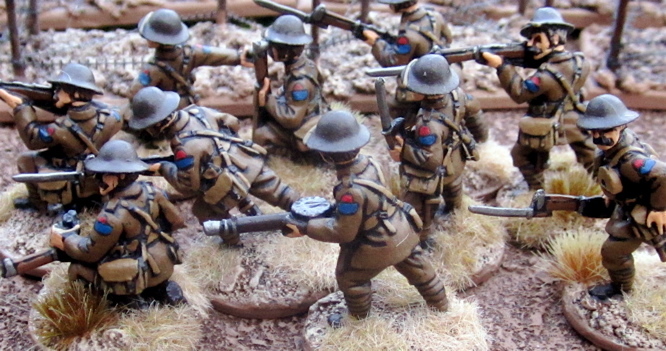 I do have the 23rd battalion sitting on the workbench, however, just in case the mood strikes!